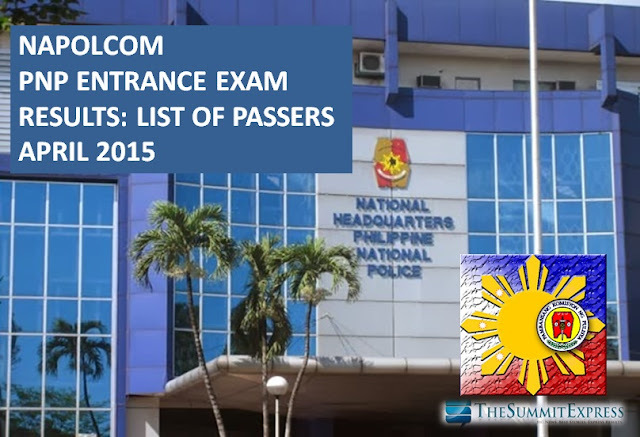 The National Police Commission (NAPOLCOM) officially released on Tuesday, July 7, 2015 the full results of April 2015 Philippine National Police (PNP) Entrance exam. The complete list of passers is now available on this page. NAPOLCOM said that a total of 2,110 out of 13,334 (15.82%) examinees passed the exam. NAPOLCOM administered the PNP entrance examinations on Sunday, April 26, 2015 to a total of 35,674 examinees including the promotional test categories in designated testing centers nationwide. The three-hour entrance examination for PNP consists of questions on general information, verbal reasoning, quantitative reasoning and logical reasoning; while the promotional examinations include general information, police administration and operations, and police customs and tradition/values and ethical standards. 137708, GANGA, JUSTIN JOSHUA ..
097844, LIMEN, ANN MARGRETTE GADIANI.